Abstract. Solar influences on climate variability are one of the most controversially discussed topics in climate research. We analyze solar forcing of flood frequency in central Europe during spring and summer on interannual to multi-centennial timescales, integrating daily discharge data of the River Ammer (southern Germany) back to AD1926 (∼ solar cycles 16–23) and the 5500-year flood layer record from varved sediments of the downstream Ammersee. 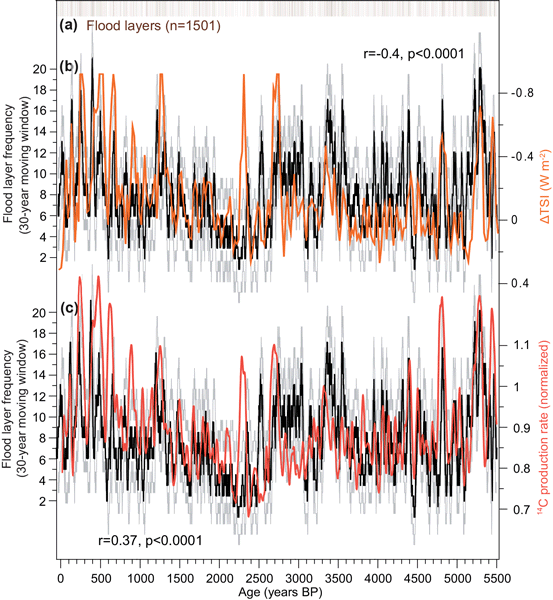 Flood frequency in the River Ammer discharge record is significantly correlated to changes in solar activity when the flood record lags the solar signal by 2–3 years (2-year lag: r = −0.375, p = 0.01; 3-year lag: r = −0.371, p = 0.03). Flood layer frequency in the Ammersee sediment record depicts distinct multi-decadal variations and significant correlations to a total solar irradiance reconstruction (r = −0.4, p < 0.0001) and 14C production rates (r = 0.37, p < 0.0001), reflecting changes in solar activity. On all timescales, flood frequency is higher when solar activity is reduced. In addition, the configuration of atmospheric circulation associated with periods of increased River Ammer flood frequency broadly resembles that during intervals of reduced solar activity, as expected to be induced by the so-called solar top-down mechanism by model studies. Both atmospheric patterns are characterized by an increase in meridional airflow associated with enhanced atmospheric blocking over central Europe. Therefore, the significant correlations as well as similar atmospheric circulation patterns might provide empirical support for a solar influence on hydroclimate extremes in central Europe during spring and summer by the so-called solar top-down mechanism. 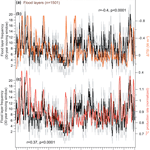 How to cite: Czymzik, M., Muscheler, R., and Brauer, A.: Solar modulation of flood frequency in central Europe during spring and summer on interannual to multi-centennial timescales, Clim. Past, 12, 799-805, https://doi.org/10.5194/cp-12-799-2016, 2016. Integrating discharge data of the River Ammer back to 1926 and a 5500-year flood layer record from an annually laminated sediment core of the downstream Ammersee allowed investigating changes in the frequency of major floods in Central Europe on interannual to multi-centennial timescales. Significant correlations between flood frequency variations in both archives and changes in the activity of the Sun suggest a solar influence on the frequency of these hydrometeorological extremes.